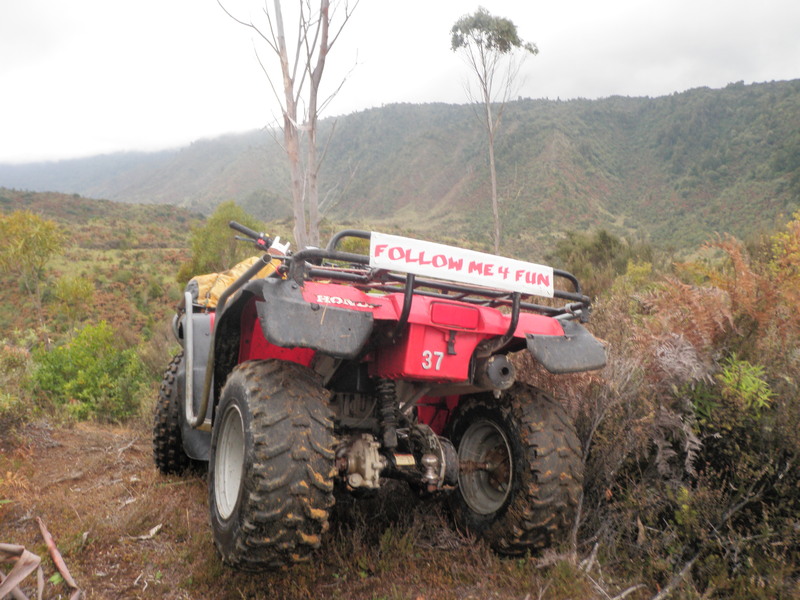 Hi again, Tongariro and other Taupo rivers are currently in flood or have high water while writing this which should mean we will be having fresh run spawning fish entering the system as we speak for the weekend. Mixed results have been reported over the past few days but in general fishing has been prettyÂ good for anglers which have explored the rivers. 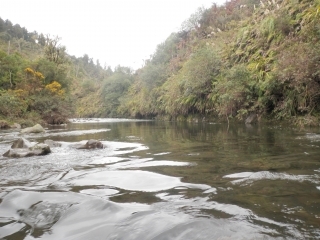 The Tongariro has had very few anglers all week and those who are here have been able to fish stretches of river without interference from other anglers which is a rarity these days on this river. I have been out a couple of times during the week and have managed to hook and land good numbers of fish by myself and with clients by hitting the water early. I fished in the braids the other morning at day light and had 10 fish on the bank by 8am, I strongly feel that getting on the water early helps with getting good numbers of fish for the day. I guided John from Liverpool on Wednesday morning and we hit the braided area at about 9am which I think was quite late for this area as when we arrived anglers were all going home carrying trout which they had caught by getting the first lines through the best lies. We had this area to ourselves for most of the morning and managed to hook and land 3 fish which I think we could have done a lot better by being 2 hours earlier. 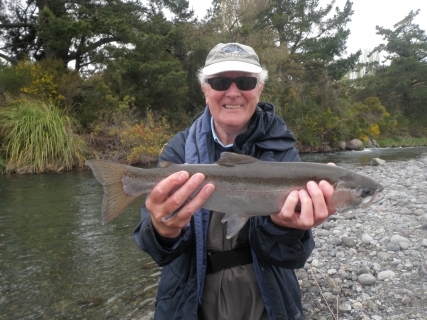 John was a very experienced angler but had not thrown weighted flies before so at times struggled with Tongariro nymphing system but in the end we got there and he was able to experience a true fresh run solid silver bullet from the famous Tongariro. When I fish I like to move around quite quickly and do as much home work as I can for my guiding and clients so I have managed to fish a lot of the upper river aswel which seems to have good numbers of fish in it since the bad weather. The duchess, Stag, Barlow’s, Blue and the Sand all produced fish for me this week using small naturals or very small glo bugs. Hen fish are just about always taking the natural at the moment and the jacks being frustrated will take the glo bug on most occasions. I had most of my fish out on a PT flash back with small rubber legs and UV dubbing tied in on the body,this fly really shows up in clear conditions and they love it. Never be scared of using small naturals as you can catch big fish on a small hook but wont catch small fish on a big hook. Some of the big browns I landed last year were all caught on size #16 hare and coppers or very small white caddis, so as long as you hook that fish with a solid strike it should hold if played correctly. I know everyone thinks that wetliners seem to land all their fish due to the size of hook that the wet fly is tied onto but it is not the case they loose as many as everyone else, ask Wayne!! 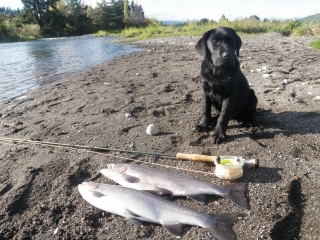 With the Tongariro likely to be very high over the weekend wet liners will do well by fishing the margins as fish will have pushed to the side to escape the strong flow of the extra water. Wet lining can be great in these conditions especially withÂ a slight tinge of green in the water which will excite trout into dropping their guard and feed on large food as well as small nymphs. I personally am sick of the rain but as we seem to be getting plenty of it I know want heaps and heaps of it as this will clean all the rivers out for summer and give as the first dirty water in the canal at Lake O which will in return produce a 30 fish session. I am in waiting for this to happen because it can be the sport in the region if you time it right and the best fishing you will get from the shore of any lake. Lake O can fish very well all the time when the wind allows boaties onto the lake and stripping wet flies at this time of year will see good numbers of fish from the weed beds, but when that canal floods you cant beat it. Use a medium length trace with a couple of small bead heads and nymph the canal just the same as you would any river ,swapping and changing the nymphs around till you find the perfect combination. Most taupo rivers will still be high for you weekend guys but should be fishable if the rain holds of or stops now. The Tauranga Taupo has been fishing well the last month or so with plenty of fish spawning late in this river again which has provided a good alternative from the Tongariro. This river is hard to get onto fish in when it is clear but if it has the slightest bit of colour in it you should not drive past it as it will be worth having a explore. Most pools are quite well cleaned out of snags at the moment and you can enjoy nice long drifts in most pools now without the threat of loosing all your gear. I have the afternoon free and will be heading down to the Waytahanuie for a look at the lower reaches as this should also have had a fresh run through it over the past couple of days. Anglers that have been standing in the rip when the wind has been ok have caught some nice trout so there must be a few in the river. With the Tongariro in flood today I should imagine that this river has got a flogging as it is spring feed and rain does not often effect it. There seems to be some nice jacks moving into this river which means that a few hens will be following so good angling is expected here in the next few days. Back country rivers have fished very well when anglers have been able to get into them between breaks in the weather. 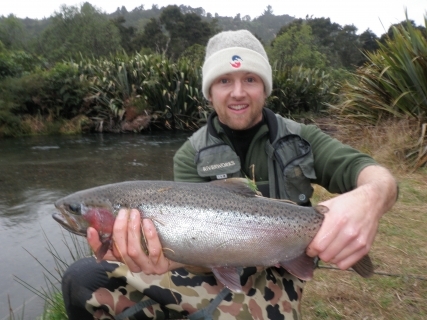 Huge numbers of fish have been getting caught in the upper Whanganuie by clients taking guides. 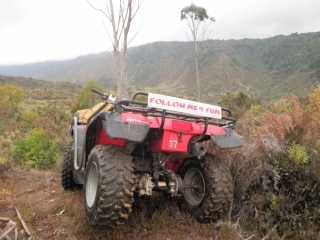 To get to this water in most cases you will need a guide with a quad bike which has permits through forestry and private farms but the cost of the guide for the day is well worth it and you wont be disappointed nor come away with no fish. The weather is not pretty people but fromÂ a fishing point of view it would be worth the trip to Taupo or Turangi this weekend as I will expect the river to fish well as soon as the high water drops.